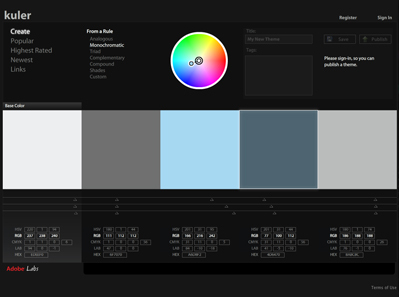 If you want to find the perfect matching colours for your new homepage or blog, try Kuler. You give it a Base Colour and you're getting four which are somewhat related to each other. Change to Complementary for example in the menu above and you're getting said. You can also add your own specific four colours. And finally: Create an account and publish your favourite combinations. Play around and enjoy (web)colour. More details at Veerle's blog (=via).